PD Ports has welcomed the delivery of a new ship to shore crane which will support growing demand from shippers using Teesport to serve northern UK markets. The £6m crane was delivered to be assembled at the port after being manufactured by Liebherr Container Cranes Limited in Killarney, Ireland and Rostock, Germany. 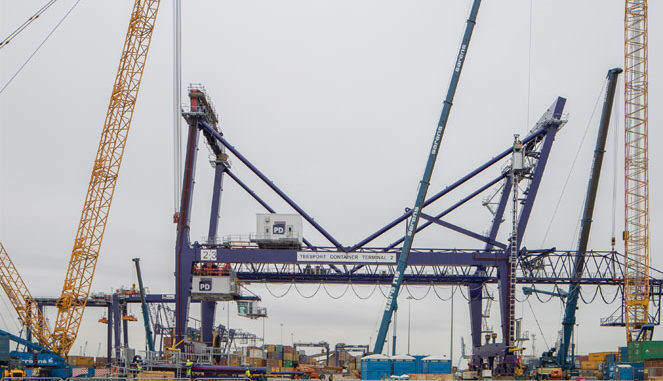 Co-financed by the European Union’s Connecting Europe Facility, the new ship to shore crane will be situated in Teesport Container Terminal Two (TCT2), boosting the port’s ability to service greater container volumes, which have grown 12% year-on-year for the last seven years. Arriving less than a year after Teesport introduced three new rubber tyred gantry cranes (RTGs), the addition of a fifth ship to shore crane will enable PD Ports to deploy additional resource onto vessels calling at TCT2, which will become critically important as larger container vessels join customers’ fleets. The port’s CEO Frans Calje said: “We have been gradually building our container platform over the last 10 years and we have continued to see year on year growth as a result of our investment. “This increase in volume has been supported by our wider portcentric logistics offer and direct rail links to the North and South of the UK. “This has enabled us to support our customers in achieving greater flexibility in their supply chains, cutting costs, saving road miles and reducing emissions.